(Nanowerk News) A new learning system developed by MIT researchers improves robots’ abilities to mold materials into target shapes and make predictions about interacting with solid objects and liquids. The system, known as a learning-based particle simulator, could give industrial robots a more refined touch — and it may have fun applications in personal robotics, such as modelling clay shapes or rolling sticky rice for sushi. In robotic planning, physical simulators are models that capture how different materials respond to force. 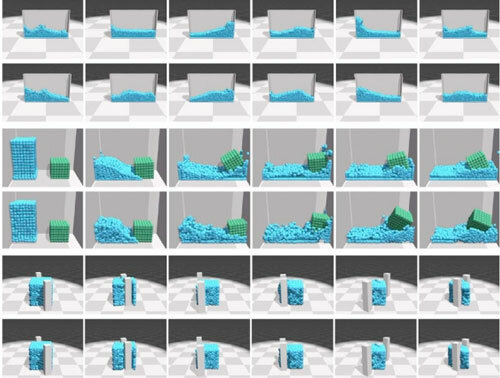 Robots are “trained” using the models, to predict the outcomes of their interactions with objects, such as pushing a solid box or poking deformable clay. But traditional learning-based simulators mainly focus on rigid objects and are unable to handle fluids or softer objects. Some more accurate physics-based simulators can handle diverse materials, but rely heavily on approximation techniques that introduce errors when robots interact with objects in the real world. In a paper being presented at the International Conference on Learning Representations in May ("Learning Particle Dynamics for Manipulating Rigid Bodies, Deformable Objects, and Fluids"), the researchers describe a new model that learns to capture how small portions of different materials — “particles” — interact when they’re poked and prodded. The model directly learns from data in cases where the underlying physics of the movements are uncertain or unknown. Robots can then use the model as a guide to predict how liquids, as well as rigid and deformable materials, will react to the force of its touch. As the robot handles the objects, the model also helps to further refine the robot’s control.